Before you text or email a patient, brush up on your HIPAA compliance know-how—or face serious consequences. Many healthcare facilities have not done the work necessary to conduct an accurate and thorough assessment of their PHI security risks. You already know that HIPAA applies to all healthcare professionals, but do you know how to practice proper compliance in an increasingly digital age? 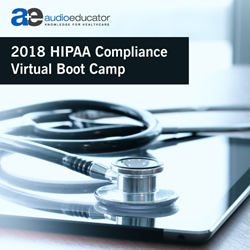 AudioEducator, a division of audio conference and corporate education leader ProEdTech, will host the virtual boot camp “2018 HIPAA Compliance” with HIPAA compliance consultant Jim Sheldon-Dean on Tuesday, March 13, 2018, at 11:30 am ET. This session will discuss new ways to communicate with your patients in 2018 (and how to “de-identify” the information shared)—as well as examine the requirements of a HIPAA security risk analysis. More and more patients want their healthcare providers to communicate via text and email. But along with the convenience of these communication methods comes HIPAA-compliance challenges. Whenever you share personal health information (PHI), you must protect the identity of the individual(s) whose information is involved. But de-identification of PHI is not an easy process (especially since HIPAA doesn’t allow simple fixes such as the use of patient initials). Sheldon-Dean will review guidance from the U.S. Department of Health and Human Services and the National Institute of Standards and Technology on how to properly de-identify health information. Plus, he’ll walk you through the risks of using text/email communication—and point out the compliance pitfalls to avoid. In this comprehensive presentation, you’ll learn to conduct an accurate and thorough assessment of all the PHI-security risks your organization faces—and develop security policies to reduce your exposure. Even if you think you have the best practices in place, now is the time to evaluate your supporting policies and procedures to be sure you’ve outlined consistent service and compliance for today’s risk landscape. Sheldon-Dean will teach you to conduct the HIPPA-required information security risk analysis—and offer several useful tools for that task. The session will benefit all personnel involved in, interested in, or responsible for: patient communications, information management, and PHI privacy/security. For more information and to register, visit: https://www.audioeducator.com/virtualbootcamp/hipaa-compliance-training. Get $40 off on our conferences and webinars. Use Code PRWEB40 on checkout (applicable for all purchases).